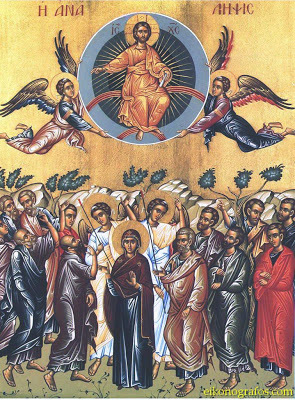 1) Your Holiness, what is a good starting point for understanding the Ascension? [Pope Francis:] Let us start from the moment when Jesus decided to make his last pilgrimage to Jerusalem. 2) What can we learn from this?We too should be clear in our Christian life that entering the glory of God demands daily fidelity to his will, even when it demands sacrifice and sometimes requires us to change our plans. 3) How does Luke's Gospel describe the Ascension?At the end of his Gospel, St Luke gives a very concise account of the event of the Ascension. 4) What is the first point?First of all, during the Ascension Jesus made the priestly gesture of blessing, and the disciples certainly expressed their faith with prostration, they knelt with bowed heads. If we entrust our life to him, if we let ourselves be guided by him, we are certain to be in safe hands, in the hands of our Saviour, of our Advocate. 6) How does Luke's other book--the book of Acts--record the Ascension?St Luke too recounts the event of the Ascension — at the beginning of the Acts of the Apostles — to emphasize that this event is like the link of the chain that connects Jesus’ earthly life to the life of the Church. 7) What does the Ascension imply about Jesus' presence with us?Dear brothers and sisters, the Ascension does not point to Jesus’ absence, but tells us that he is alive in our midst in a new way.